The CX500 got a unfairly bad wrap from early reviewers upon its release in the late ’70s but quickly became a hit with tourers, cruisers and dispatch riders. Given the public’s appreciation of the model, Honda sought to give it a freshen up in the form of the CX650 that received more positive reviews, but didn’t get the cult following it’s little brother still attracts to this day. It’s clear we motoring journalist don’t always get it right nor can we always predict the models that are going to be a hit but had Mathieu Renaud been building bikes in the mid 1980’s the CX650 would most certainly have taken off. 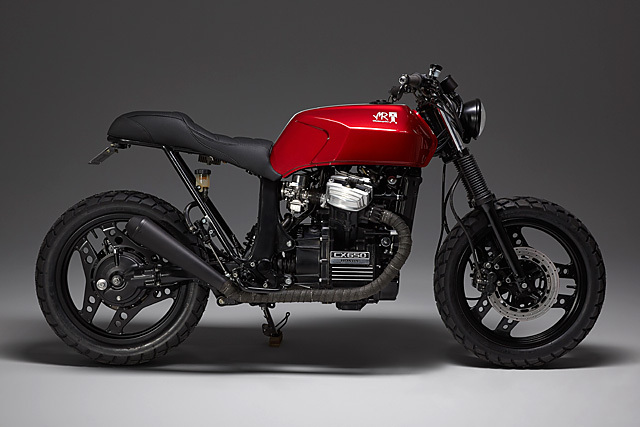 He’s the mastermind behind this stunning 1984 Honda CX650 Scrambler that finally gives the model a custom creation many thought would come years ago, but the waits been worth it! 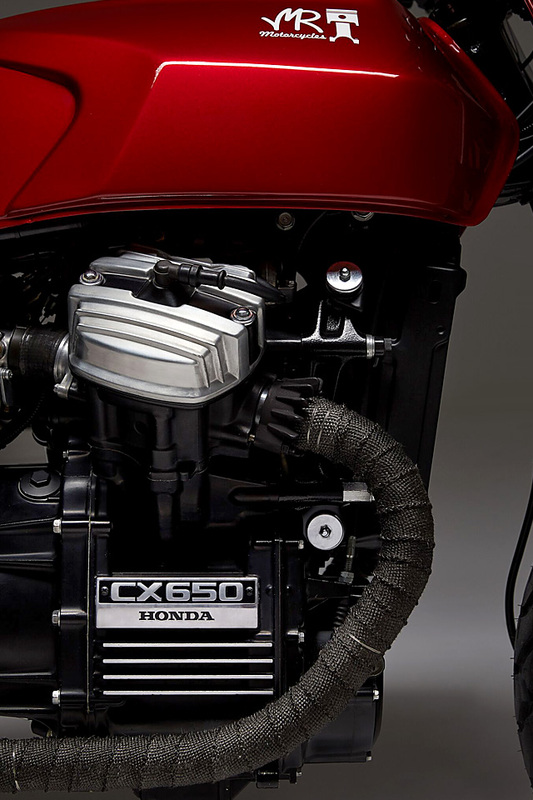 The improvements Honda made to the CX650 over the CX500 model should have resulted in a winner, more power, better handling and a fix for many of the small problems that had begun to show up in the earlier model. But 1984 was not a great year when it came to fashion and with motorbikes being designed by ruler and decorated with straight lines and square edges the styling was never going to survive the time but for a handful of misty eyed tragics. 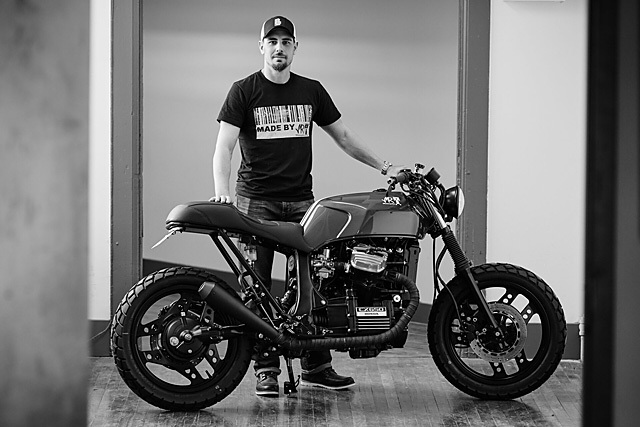 But having built an exceptional custom CX500, Mathieu, the head honcho of MR Motorcycles in Montreal wanted to give the 650 a go and see just what he could come up with. Having found one in reasonable enough condition to fit the bill, $1400 Canadian was handed over and Mr Motorcycle had himself a project. 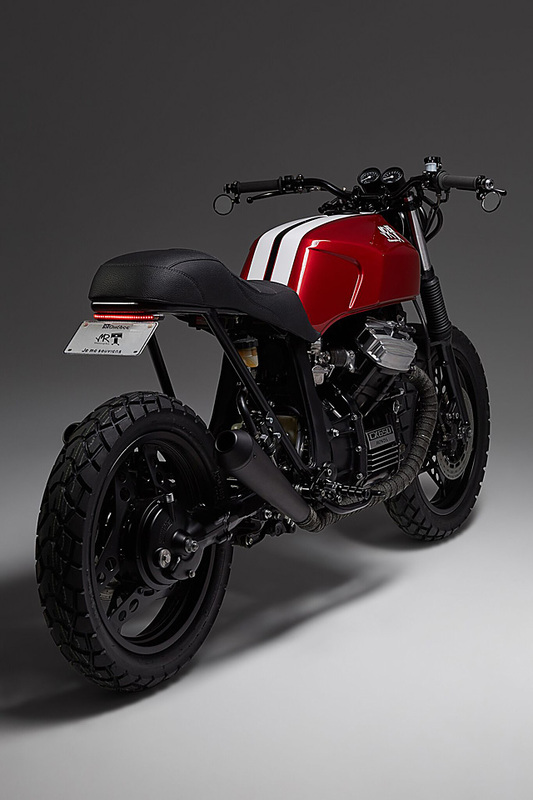 “I chose this motorcycle because it is not a very popular model to be customized. The frame requires major modifications to look good. Which means I had to take the whole bike apart to redesign the frame.” That frame is not dissimilar to the earlier models frame and although the subframe is different it’s just as difficult to work with, so it was straight off! In its place Mathieu fabricated a rear frame that has much cleaner lines, no obscure side loops and a shape that would fit with the theme of the bike. The top of the new subframe is designed with the seat that was planned for the bike in mind and a new rear hoop was welded into place before the whole frame was given a coat of black paint. With no intention of ever bolting back on the plastic side covers or rear fairings that would normally hide the wiring and many of the electrical components Mathieu integrated into the bottom of the seat area mountings for each component to keep them hidden and neatly tucked away. This also allowed for many of the factory brackets that would otherwise dangle these components below the subframe to be cut off and give the entire bike a much cleaner and less bulky look than the stock item. A rear mount for the tail light was fabricated and then all of the area supporting the electrics was boxed in except for that holding the regulator rectifier allowing it to be cooled by the passing air. To cover it all up the original seat was thrown to the side but the replacement unit that Mathieu has created looks factory, so good is the fit. Not only has he ensured the lines hug the subframe the seat is then moulded to the shape of the rear section of the tank so that the all important junction between the two is no longer squared off or exposed but covered by smooth lines that integrate together beautifully. The shaped foam was then covered in all black leather and the piping and stitch work further accentuates the lines of this curvaceous creation. With all the plastics removed the tank remains the sole piece of bodywork and Mr Motorcycle is a deft hand at making even the worst of factory shaped tanks come to life. 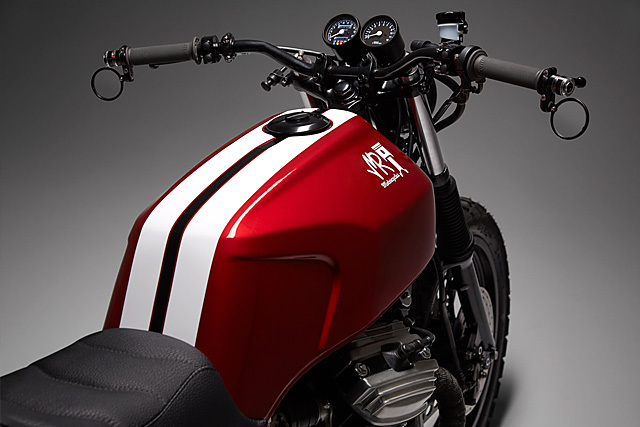 The CX650 unit is no exception, with the bodywork absolutely perfect, each crease line and curve given an exaggerated appearance to turn the once ugly item into a muscular statement for this V-Twin Scrambler. To make the most of the more masculine lines the rear was given a two inch lift and the front mounts modified to suit. The last modification to the tank was to remove the clunky factory filler and fit up a modern race style unit for a sleek final finish. Matching up to Mathieu’s brilliant metal working skills is Montreal’s JP Huet and his ability to lay down one hell of a paint job. 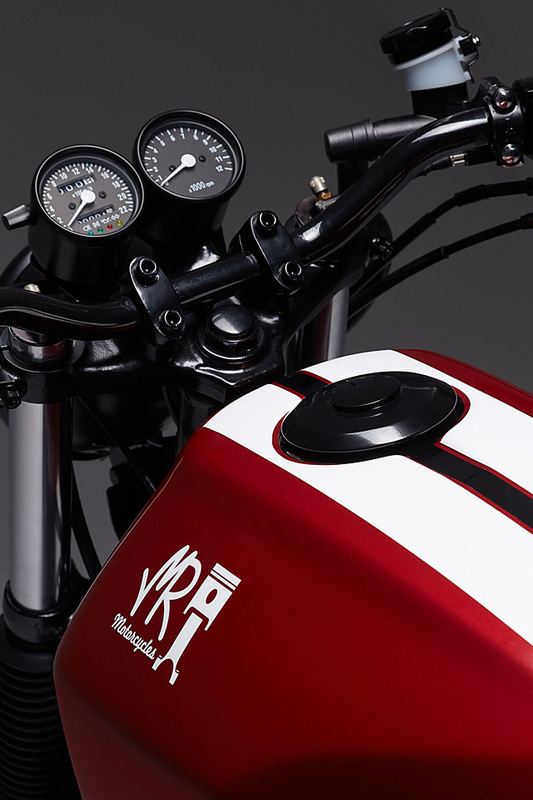 His style is instantly recognisable and strong colours and bold pinstripping are his forte and the CX650 doesn’t miss out with brilliant candy apple red laid down on the entire tank. Overlaying the bold colour is a pair of large racing stripes in white, with a central black line laid down that flows effortlessly across the filler for a well thought out finish. Breaking up the large sections of red on the side of the tank is the signature Mr Motorcycle logo in white and with paint work like that you’re going to see this CX from a mile away. What allows the red to get even more of a pop is the fact that the rest of the bike is covered in almost exclusively black paint, including the lower front fork legs that have also been fitted up with a pair of gaiters. The forks themselves are the factory Honda items with air assist and they’ve been rebuilt with new internals to bring the performance into the 21st century. To match a new rear shock was fitted up with the factory specs retained so as to work seamlessly with the Honda Pro-link rear end. All of which helps get the power to the ground from the V-Twin Honda engine that takes the best of the old models developments and brings them to new heights. The extra 177cc capacity comes from Honda boring and stroking the old 500 and with an extra 11mm of stroke you’d expect the engine to not be as rev happy. But the pushrod twin defies the odds and makes 64hp @8000rpm which would not be anything to sneeze out some thirsty years later from a factory 650 twin. To recapture any lost ponies that had escaped over the years Mathieu treated the engine to a full factory rebuild with new gaskets and seals to maintain that ever impressive Honda reliability. Then he ditched the heavy factory exhaust and replaced it with pipe wrapped headers down each side that end in blacked out reverse cone mufflers that hug tight to the bike to give a leaner look. The factory airbox and associated breathers are all gone and the big 39mm Keihin carbs now draw breath thanks to a pair of Uni Pod filters. To call a halt to proceedings Mr Motorcycle stuck the front discs up on the drill press “The rotors were cross drilled to give the bike a sportier look” and also get a little extra cooling as a result to improve feel at the lever. While the rear single disc has its master cylinder relocated to suit the new subframe, the front ends item was tossed aside for the far more powerful master cylinder from a 2010 Honda CBR600RR. Mounted up on the tracker style bars with new levers and grips the CX650 now has the sort of rider control it was always screaming out for from the factory. The stock front end had worn a plastic bikini fairing that was about as attractive as Borat’s one piece and so it’s been kicked to the curve and a smaller headlight installed for a cleaner look. The factory dials were as equally hideous and in their place two small gauges feedback the vital signs to the rider. While the rest of the switch gear and lighting as all been replaced with big dollar Motogadget items. 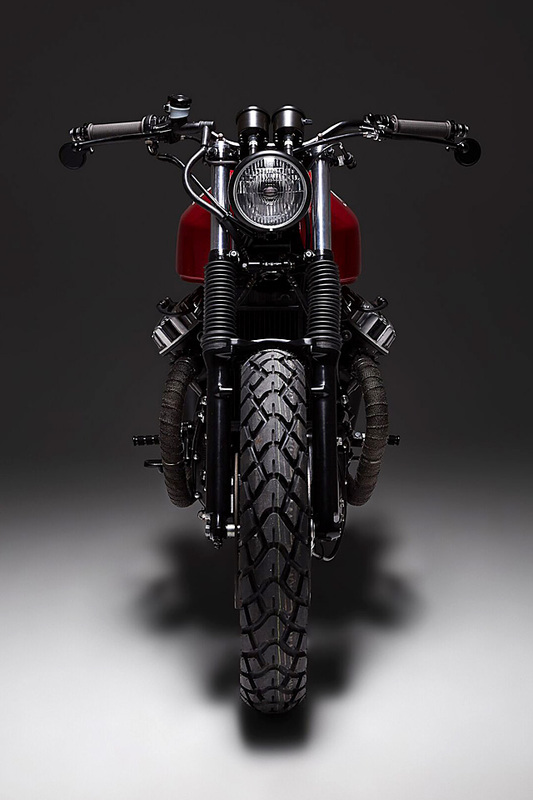 Apart from the headlight all other lighting is LED with a rear strip tail light and Motogadget bar end turn signals pocking out through the cafe racer style mirrors. Along with much of the engine the factory wheels have been powder coated in black and have never looked so good, wrapped in dual sport 70/30 tyres also means this Scrambler can tackle just about any surface and in any conditions should the need to ride through a muddy paddock become a desire. But most of all what this build does is prove that despite the CX650’s fairly horrific factory looks it is possible to make a purse from a sow’s ear and Mr Motorcycle has combined that Scrambler styling with the mechanical package that truly stands the test of time. It provides all the smooth torque of a young George Clooney, finally wrapped in a package that would make Steve McQueen smile, prices on old CX650’s just went up!